Are “reasonable alternatives” being sought now, or will most/all of the attention of our laboratories be focused on gene editing? Who decides what is a “serious disease or condition”? At what level are genes considered to “strongly predispose” to a disease or condition? Does that mean genes which may predispose to breast or colon cancer in mid-life will be targets of gene editing, akin to the licensing of preimplantation genetic diagnosis in the UK? How does a researcher maintain “rigorous oversight of the effects of the procedure on the health and safety of the research participants” if the participant is an embryo, a child, or an adult whose genome has been changed? To what kinds of follow-up will these participants be subjected? How will one’s personal autonomy as well as privacy be “respected” if, as an embryo one’s genome was tinkered with, and now inquiring scientists want to know? Who created these recommendations? 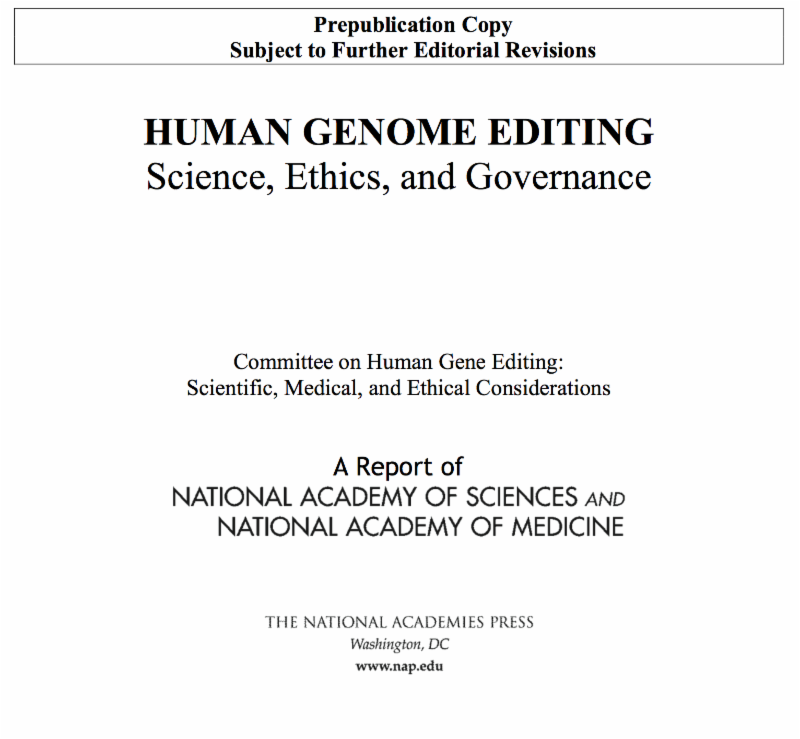 The list of creators includes a number of scientists who already do gene editing, so such recommendations are not surprising. Public input is now recommended by the committee. The current effect of this provision is to make it impossible for U.S. authorities to review proposals for clinical trials of germline genome editing, and therefore to drive development of this technology to other jurisdictions, some regulated and others not. Perhaps a call to your representative and senators during the month of March would be helpful. Let them know of your opinion regarding germline gene editing of embryos and future generations. It would be your public service. Additionally, if you desire your own copy of the committee’s report, it can be purchased here, or downloaded without charge here.